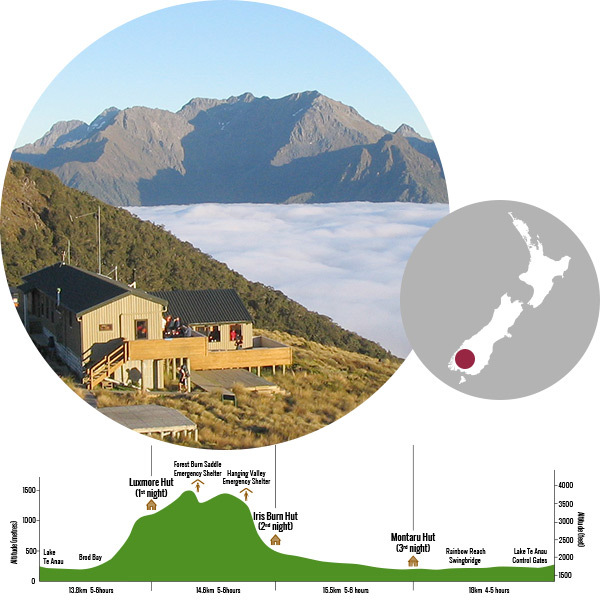 The Milford Track is regarded as one of the most scenic multi-day hikes. 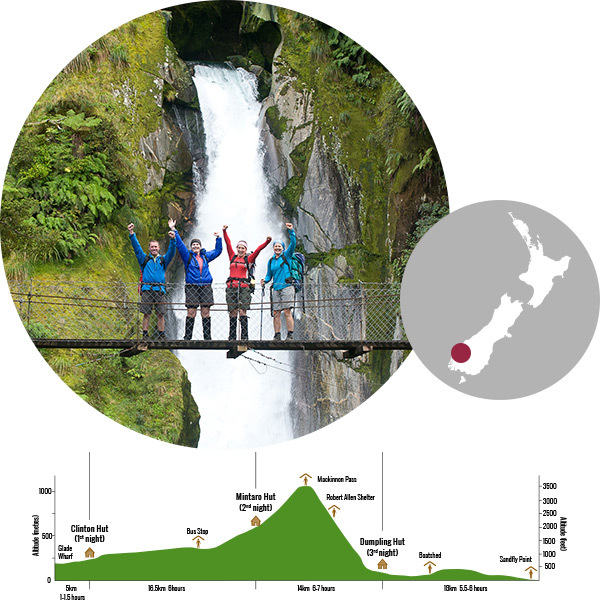 This Great New Zealand Walk through a World Heritage area takes four days to complete. The Milford Track is your opportunity to leave the outside world behind for a few days and nights and engage with nature. The Routeburn Track traverses the Southern Alps (Kā Tiritiri o te Moana) of New Zealand and passes through pristine mountain rivers and streams, amazing alpine lakes and tarns, herb fields, pristine forest, expansive mountain views and cascading waterfalls are all right there. 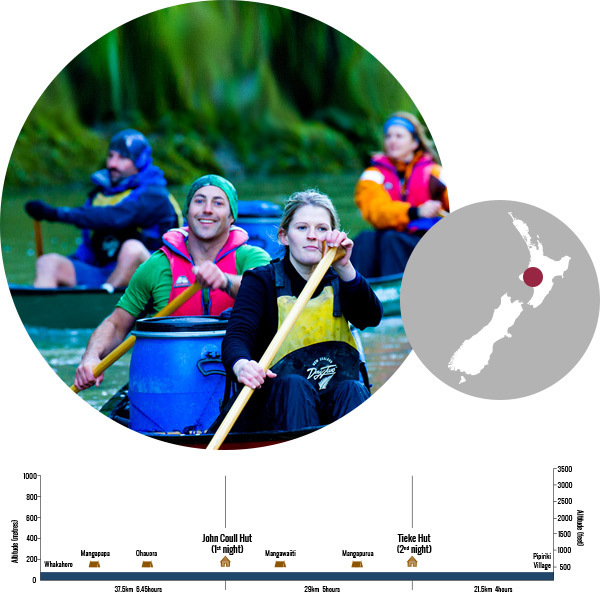 A river journey, the Whanganui is part of New Zealand’s Great Walks network. The Whanganui River winds its way through the mountains to the Tasman Sea through a landscape of valleys and hills in the central west of the North Island into the heart of the Whanganui National Park. This exhilarating outdoor package sea kayaking and tramping part of the Abel Tasman Coast Track, brings visitors past golden beaches, coastal forests and towering cliffs. The crystal clear water and marine reserves is a feature of this diverse and naturally beautiful area. 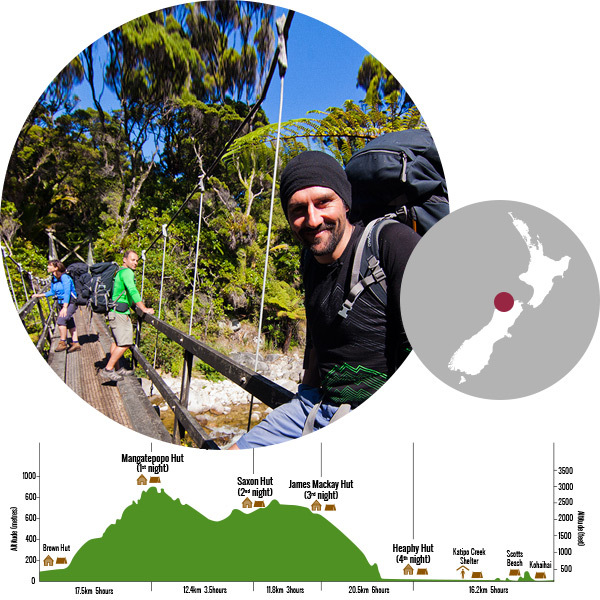 The Heaphy Track is the longest of New Zealand’s Great Walks and is highly regarded for its variety of landscapes. Podocarp bush, beech and nikau forests, numerous stream and rivers interspersed with tussock grassland will give walkers a variety of stunning scenery. The Kepler walk starts along the shores of Lake Te Anau. It is a nature enthusiast’s dream which involves some hard yards but stunning scenery. 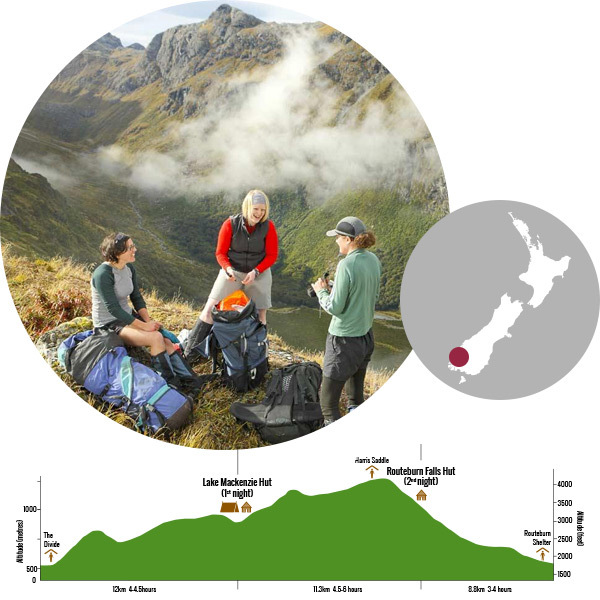 High alpine ridges, primordial forest, rugged gorges and wild flowing water await walkers on the 60km circular Kepler Track. The Rakiura track is peaceful and relaxed, a real island paradise. Experience untouched forests, tidal flats, rugged ocean views and the chance to see kiwi in their natural environment reward the more adventurous traveller seeking a less trodden path. 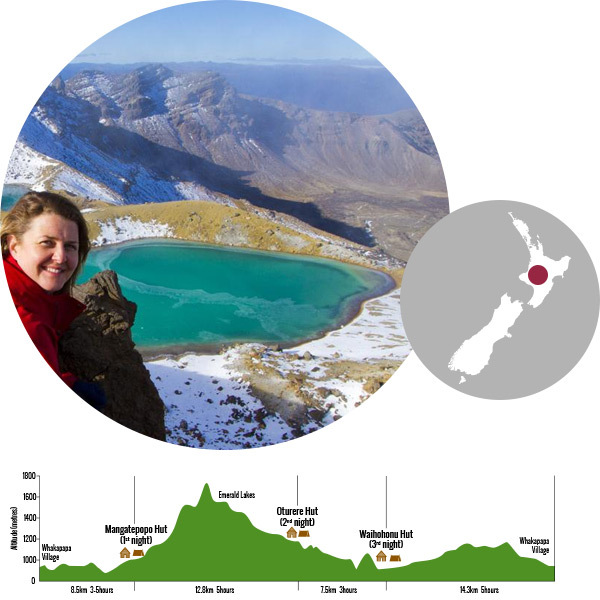 The Tongariro Northern Circuit circumnavigates the volcanic cone of Mt Ngauruhoe. The volcanic landscape and cultural heritage combine for a unique experience. The Ngati Tuwharetoa and Ngati Hikairo ki Tongariro tribes consider the area sacred and connected to the mountains. In conjunction with the Department of Conservation, we have the pleasure of providing complete packages that will enable you and your friends to encounter the awe-inspiring landscapes on these premier walking tracks. 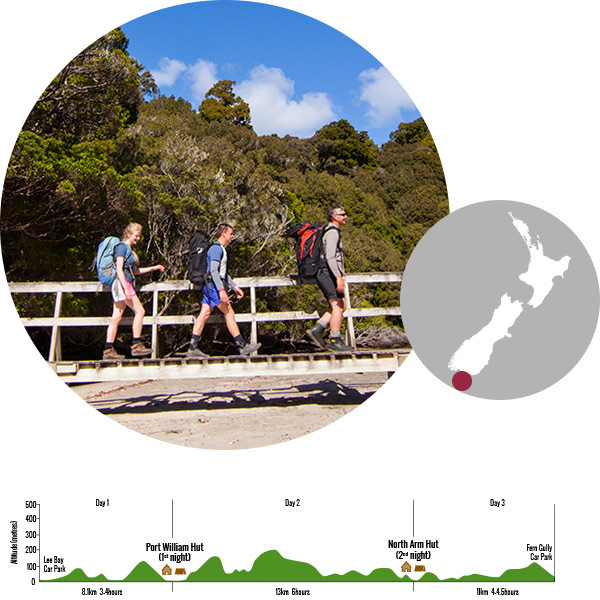 Explore and tramp the Great Walks of New Zealand without a guide. Each person is required to carry their own food, basic cooking equipment and bedding. Along the way you will stay in Department of Conservation Huts which will be pre-booked. 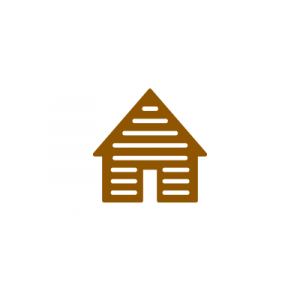 Pre and post accommodation, transportation to and from the walk start/finish locations, plus your selected ‘Great Walk’ including pre-booked huts on along the way. Experiencing first hand some of New Zealand’s spectacular landscapes. 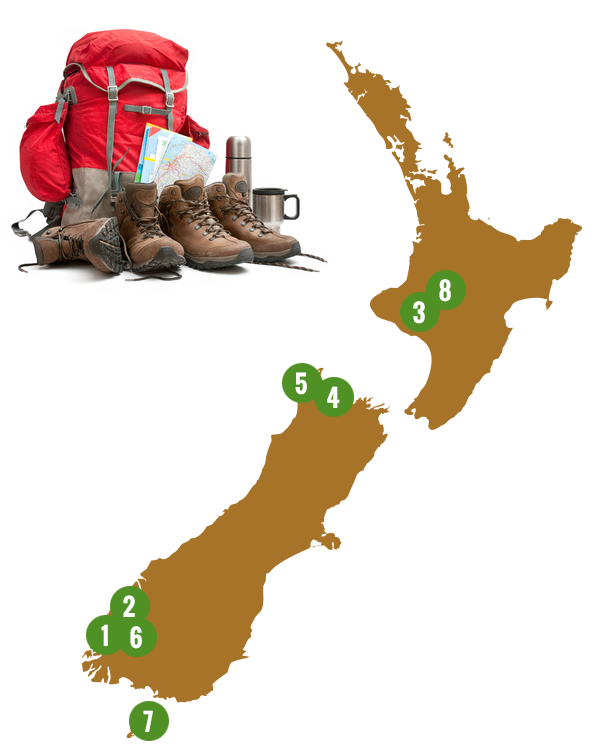 How to book my next walk? 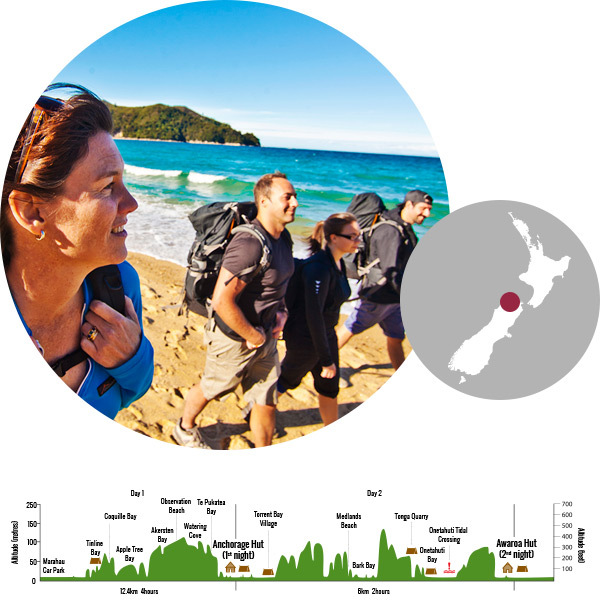 Let Just New Zealand Walks take the hassle out of planning your next independent freedom walk. We have everything you need to get you enjoying our beautiful country, New Zealand. Numbers are limited - Book early to secure your space. With Just New Zealand Walks – Experience the real New Zealand on your terms with an independent freedom walk in NZ. Great Walks are the Department of Conservation’s premier walking tracks that pass through some of New Zealands most awe-inspiring landscapes. 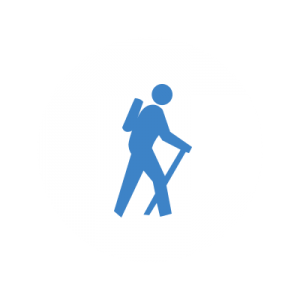 Our new independent walking packages are designed especially for visitors who want to spend less time planning and more time exploring. 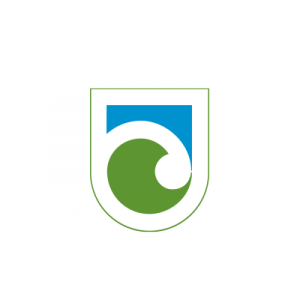 We are also pleased to introduce Department of Conservation Independant Walking and Canoeing/ Kayaking Packages – The Abel Tasman Experience and The Whanganui Journey. We have a team of experienced staff who are ready to help you book your next big adventure.The hardest part is choosing which Freedom Walks to do!